Former jockey Carl Llewellyn has been fined £1,500 by the British Horseracing Authority after admitting bringing the sport into disrepute. The 48-year-old was reported to have made a racist comment during a public event prior to the Cheltenham Festival. The original hearing was postponed on 3 April to allow Llewellyn's solicitor more time to prepare his case. The BHA also wanted to determine if the reported comments amounted to "conduct prejudicial to horse racing". The former rider, who is now assistant trainer to Nigel Twiston-Davies, is alleged to have made the comment at the Hollow Bottom pub in Gloucestershire on 10 March. Llewellyn, from Wantage in Oxfordshire, has ridden more than 500 winners to date, including five at Cheltenham's National Hunt Festival. 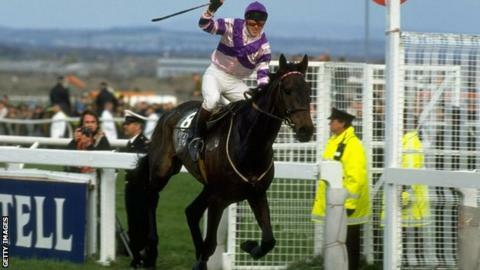 He triumphed on Party Politics in the 1992 Grand National and won the race again six years later riding Earth Summit. Read more on Cheltenham 2014: Who will have their name in lights next year?